Detailing the physical features, habits, territorial reach and other identifying qualities of the Mydas Fly. 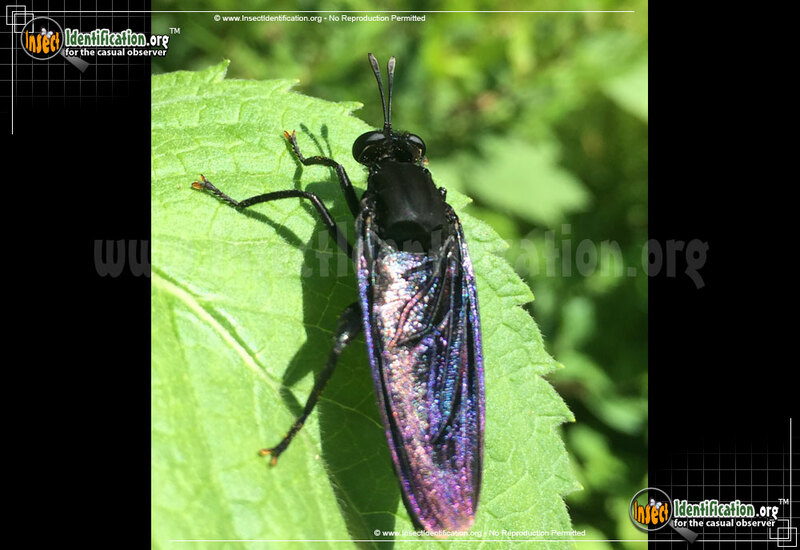 The Mydas Fly does not turn anything to gold, but there are only a few types in North America, making it somewhat precious. This family of flies comprises some of the largest flies in North America. Some of the species in the Mydidae family can get as long as 60mm (2 inches). 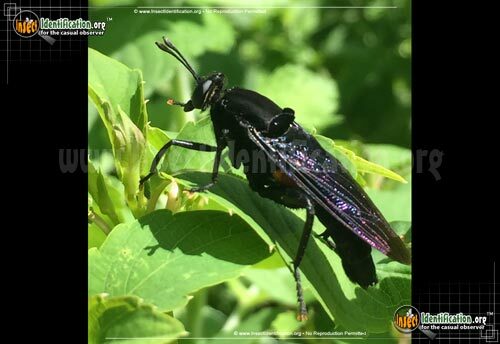 Large black Mydas Flies are harmless despite sometimes being mistaken for wasps. 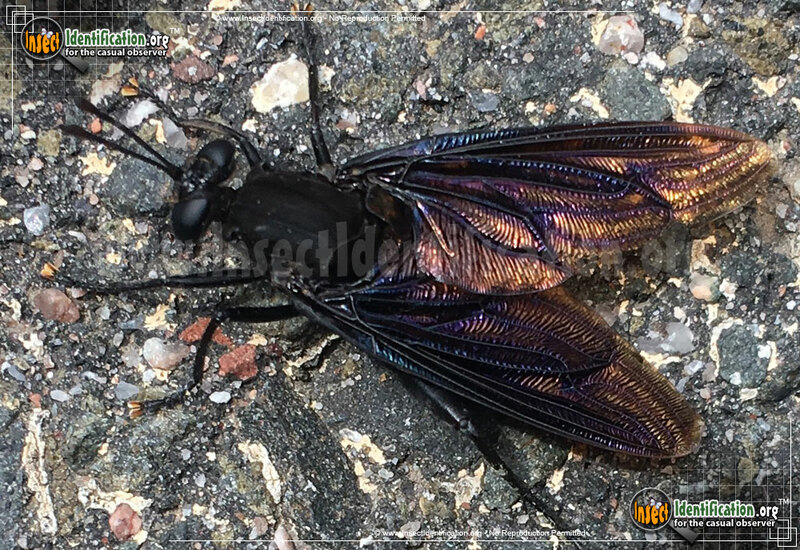 Large purple-black wings shimmer in light and are often folded over each other when resting. Female Mydas Flies lay fertilized eggs in the ground. Larvae can be found in forests near rotting and dead wood. Offspring eat other bugs and grubs that can be found in the dirt, even plump June Bug larvae. Because of the predatory diet of larvae, this type of fly is considered beneficial to have around, removing threats to plant health and produce. 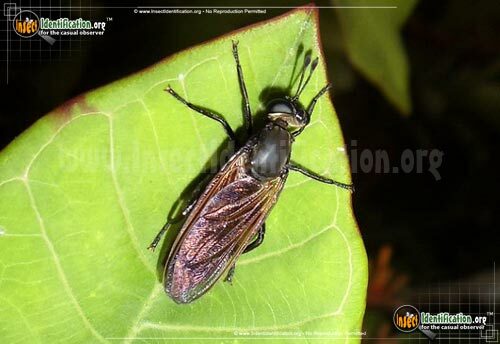 Eventually, Mydas fly larvae pupate in small chambers they create in the soil and emerge as flying adults. Adults are seen virtually everywhere (parks, garden, meadows, open lots, forests, etc.). They feed on other insects and caterpillars, including flies of other species, but they may also drink nectar. They are very good fliers, though it may not seem so at first glance. They tend to look a bit clumsy in flight. They are most active in the summer months.